This is my take on this week Color Room Challenge. I love orange. This can be justified by the fact that I painted my whole living room with two tones of orange 5 years back. This is my first time playing with tissue paper for my LO. I have lots of fun playing with them. It’s a cheap yet versatile material to use. Here’s what I did with them. I stamped the tissue paper with different words text stamps. Next, stamped over with birds and clock stamps. I have used coffee archival ink from Ranger for the stamping. I crumpled the tissue papers and spread them across the canvas which has the glue medium on. As I spread them, I created some creases for texture. I applied glue medium over the tissue paper to seal them in place. You can also see that I have applied some crackle paint over the tissue paper. These cracks appear beautifully visible on the tissue papers. (a) Use toilet roll, dip onto some gesso and stamp on 2 corners of the canvas. (b) Use corrugated paper, applied some paint and stamp on the canvas. 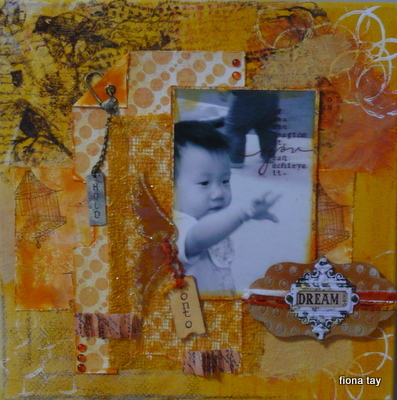 (c) Use some background stamp (netting-like background) and stamp on one corner. And one other interesting thing I tried with this LO was to create my own patterned paper (it’s the one with birdcage). I stamped the distress ink pads (spiced marmalade, rusty hinge and antique linen) on the craft mat and sprayed water on them and ‘smooch’ the white un-textured cardstock on the inked craft mat. I distressed and inked further with spiced marmalade. Next, I stamped the bird cage, using also the secondary images to give some faded look. For this LO, I have aimed to used different texture materials. Was glad to find the orange fibers from Basic Grey and the orange mesh from a floral shop to use for this LO. Also, was happy to be able to incorporate in the Tim Holtz die-cut (I have use grunge paper for the die-cut. Emm, sorry for sounding like a crazy Tim Holtz’s fan lately but really, I am one J ). As for the acrylic wing, I first inked with yellow and copper alcohol ink, followed by outlining with icing stickles. The tag ‘on to’ was engraved using Melody Ross Chip Art tools. I have also stamped a phrase on the top right corner of the photo. And for those little ruffles, I have used the words tape from 7 Gypsies to create them. I have so much fun doing this LO. I don’t think it’s perfect to me but it’s my first time trying most of these techniques. I guess practice makes perfect. So, will explore and try on more of such pieces in future. 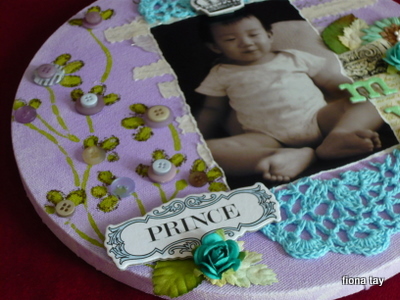 Did this layout ‘My Prince’ last Sat for participation for this week Color Room challenge. One of the color required was purple and I realised I actually do not have any purple papers or embellishments. Maybe I have but forgotten about possession of them and they may be lying somewhere, hidden from my sight. So, I decided to color the canvas purple. I had used Rum Raisin glimmer mist and washed with water to paint the whole canvas. Next, I stamped Donna Downey’s foam stamp on one side of the canvas. I used green dabber paint for stamping. And I added on the buttons to the stamped petals and outlined them with stickles (yes, I found one of the stickles finally). One the other side of canvas, I first stamped with words text using olive archival ink. Next, cut some strips of words fabric i bought recently using pinking shear and pasted them down with Beacon glue. I cut the blue crochet doily into half as i thought this will make the layout more interesting. Lastly, embellish with teresa colin and webster goodies and of course, as usual, prima flowers. Also, added on the tassel I recently bought. Am pretty satisfied with end result as it has lots of different texture which make it interesting. This is my take on Leena’s ‘Lift Me Challenge 4’. 1) It must be a 12 X 12 paper layout, no digitals please. 2) I would like your background to be BIG, & BOLD!! You can create your background using patterned paper with huge prints, you can paint it, or mist or whatever method you can think of, as long as it is BIG & BOLD!! 3) You must use overlay in your page. 4) And please use at least 1 BIG flower too. The layout started off with a white AC cardstock. I have used Tim Holtz big flourish mask and mist over with Tattered Angel Glimmer Mist (colors are: sunflower, Lime Pie, pink bubblegum). I mist layer by layer with slight overlap and in a diagonal direction. Then I mist iridescent gold all over. Afterwhich, I place paper towel over the whole misted cardstock and use brayer to roll over to blend the color. Am pleased with the result. Must really thank angel Jasmine (from MWL) who imparted all the essential skills and techniques of misting. Would not have achieved this without her. I chose one of my wedding photos for this layout as I thought that’s the best suitable photo for this layout idea I have in mind. While doing the layout, this came across …oh mine, I have been married for 5 years. 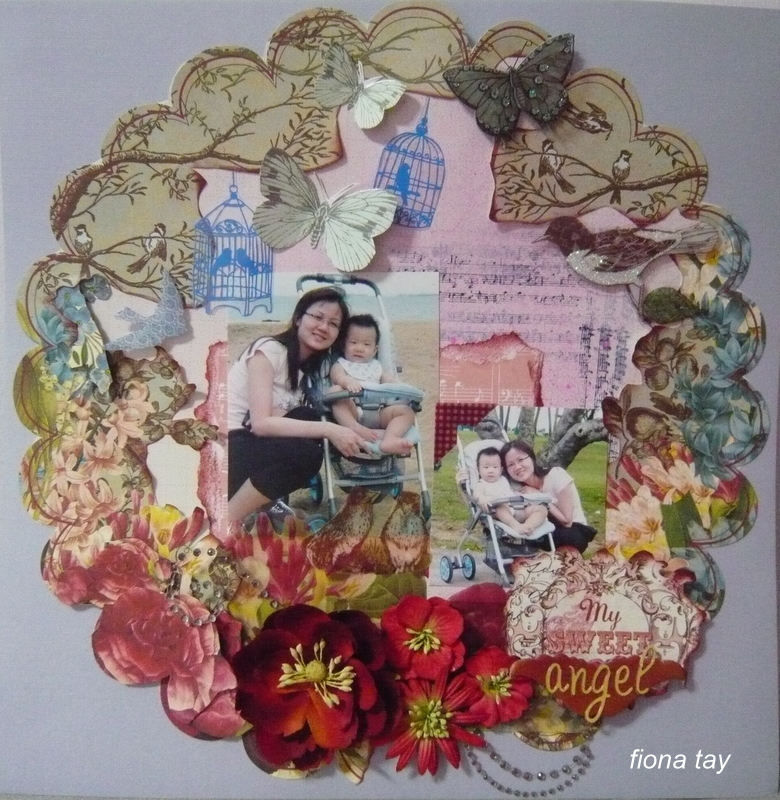 I must thank my hubby for supporting me in this scrapbooking hobby as he frequently have to attend to Zachary who woke up in midst of his sleep and mummy is still busy scrapping away or having her fingers badly stained with distress inks, paints and mists. I overlay Hambly transparency over the photo. Cut up some flowers from Webster’s papers, distressed them (color: tattered rose) and layer them on. 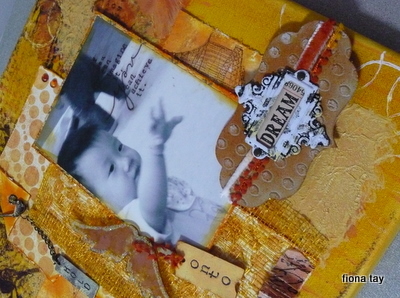 Next, adorn on with Making Memories embellishment. I have also stamped Pink Paislee Queen Bee stamp using Stazon metallic copper on the journaling text. And of course, not forgetting the Prima flowers and the rhinestones and some beautiful buttons. Wanted to add some stickles but I cannot locate them. Sigh, many bags of scrapbooking materials on the guestroom floor, waiting to be sorted and packed (pack and put where? I don’t know the answer too as storage place getting super limited). I hope u like this layout as much as I do. I have never really like brown. 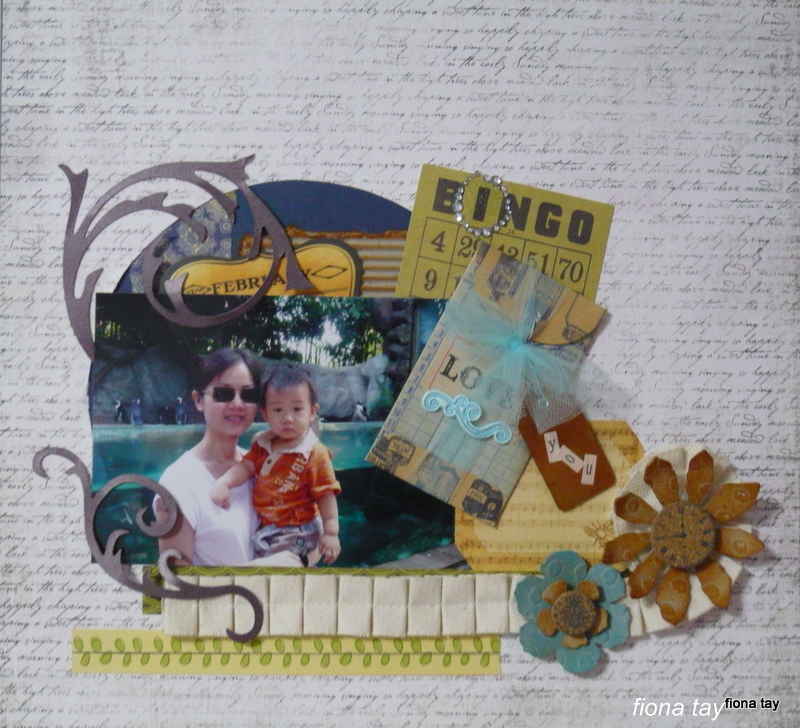 This is my first attempt using so many ‘brownish’ things for my layouts since I started scrapbooking 4 mths back. What motivate me to do it then? Well, I was actually trying out this weekly challenge hosted in this color room. Each week, there will be a color palette given for you to follow for your project. You must visit their photo gallery. Great inspiration there! And the team of ladies hosting it are all marvellous and creative. I have used MME papers, Pink Paislee Twill ribbon and embellishment, K&C, Maya Road and Jenni Bowlin embellishments. 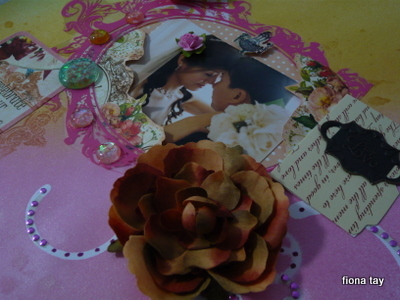 Also, used Tim Holtz Alterations Die cut for the grungepaper flowers and the flourish. The flowers are distressed with Rusty Hinge and Broken China Distress Inks. I adorn the flowers with Pink Paislee ‘cork’ embellishment. Did you see the title I made using the Bingo card? ‘I love you’ Zachary. Suppose to finish up the LO for a challenge submission today but realise I got the deadline wrong and thus too late. Blur me. Since not in rush to complete the LO then and Zachary is now asleep, I have some time now to write a post. Was happy to meet up with my ex-colleagues to have an early celebration for my birthday. Always glad to catch up with them and so grateful to Ying May to travel all way down by cab. Thank you and thank you Miang for the treat. Heard some good news from them that one of the ex-colleague has delivered and also that another close one to me, Ling Pei, is already 17 weeks pregnant! So happy for her. Would like to share a layout with you. This one was done awhile ago and I posted it up for MWL ‘lift me 2’ challenge. 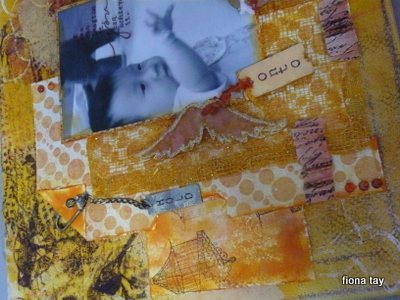 I used mainly webster papers and prima which are my favorite. Talking about webster, I can’t manage to find anymore of them in the local scrapbook stores. Arghh…. The photos for this LO was taken at East Coast a few months back. Zachary is hardly sitting in his stroller nowadays. So active now that he can walk steadily. I have recently started on taking up some of the challenges posted by the local scrapbook stores. Having won the recent ‘scrap-a-tag’ challenge posted by Laines, I felt encouraged to take up more challenges. I have found that I can scrap better with some guidelines posted by such challenges in the way that it saves me time thinking what material/ style I should use or choose. This is my take on the current MWL ‘lift me 3’ challenge. 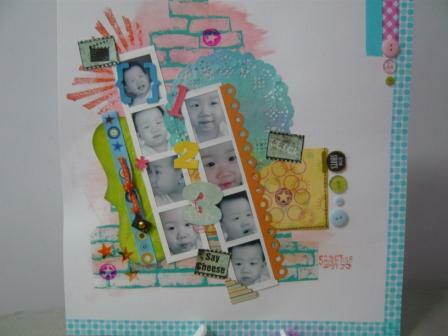 Love using hambly transparencies always and can you find the tim holtz’s stamps in the background?